Turning into my dad is scary enough, but I have also married a man just like my dad. 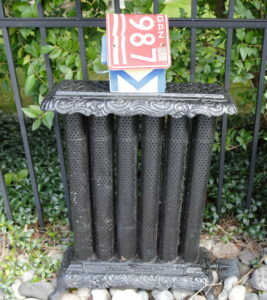 I don’t even want to think about the psychology behind that one. Years ago we used to make fun of my dad after my mom came home one day to find him painting one of the bedrooms in the house completely naked. He was home alone and didn’t want to ruin another shirt with the little paint splatters that accompany a paint roller. It has been a running joke to never show up at my parents’ house if my dad is painting. My mom has told everyone she knows about the day she came home and found her husband painting naked, so even her friends would joke about stopping by unannounced. They would say things like “I’m dropping off some paperwork in your front door. Pat’s not painting is he?” The poor Old Man has been the naked painter for much of his adult life. Luckily, nothing embarrasses him. I don’t know if this is something other people do because I am never the one who paints the bedrooms or the furniture or anything else. When the paint comes out I typically head in the other direction. I have had to clean up my daughter after she helped grandpa paint and I can see where the naked painting thing could be the way to go. My husband does the painting in our house, and I think that’s the way it will probably always be. He has been a painting madman over the last week and I have hidden in another part of the house and remained busy so he could not ask for my help. We participate in an annual trunk or treat event at my daughter’s school. Our themes have ranged from KISS to My Little Pony. Our daughter picks her costume every year and we go with that theme. It’s a lot of work, but we get to create something as a family and our daughter is always so proud of what we put together. This year was a Harry Potter theme. 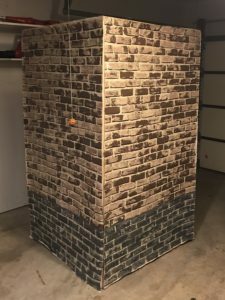 My husband constructed an entrance for the back of the car from wood and fabric to look like the wall for platform 9 3/4. The kids enter through the tunnel to get their candy. He built and painted all week. 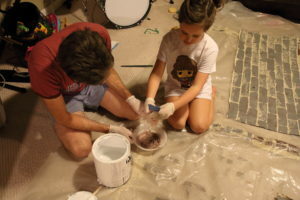 A few nights ago after I got our daughter tucked in I walked down into the basement where he was painting the fabric pieces that make up the walls of the set. 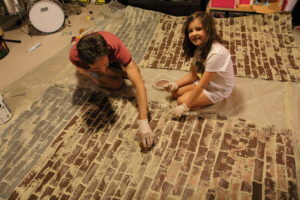 He looked up at me from the floor where he was squatting over the fabric spong painted brick wall wearing nothing but a smile and declared “I totally get it now!” He went on to explain how he had to hang the pieces to dry from the ceiling and didn’t want anything to touch his clothing which was balled up on the floor. I guess the naked painter torch can now be passed to my husband. If anyone needs to drop anything in our front door during the fall or any other time we may be working on a project, it may be best to call ahead, or don’t go peeking in the window if nobody answers the door. I would like to say this is strictly because of the naked painter thing, but truly I also vacuum in my underwear so it may just be a family thing. Again, I married a man just like my dad and I have turned into him as well. Our trunk or treat car was a success, mostly because my daughter has a dad and a grandpa that will do anything for her. The guys got the car set up at the school. They assembled the structure and hung the fabric while I got the props set up and the pumpkin juice and candy ready for the littles. 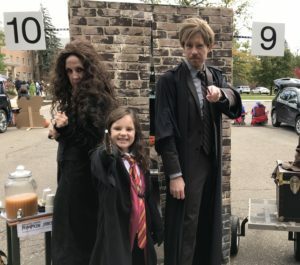 I scared some kids as Bellatrix and John was mistaken for a mad scientist by more than one kid who wasn’t familiar with Harry Potter, but we had a lot of little wizards and witches who loved the theme and most of the parents had at least seen the movies if they hadn’t read the books. And my entire family was able to keep their clothes on for the entire event. Miracles will never cease! 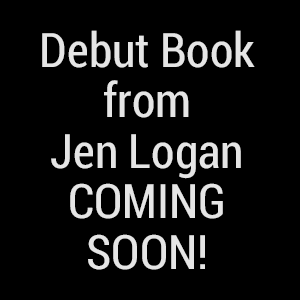 **This post is brought to you by lots and lots of punk rock and mass amounts of coffee. They are the two things that keep me going on a daily basis. I love my father, but man is that Old Man stubborn. In his mind he is a young man and his body should be able to do what he wants it to do. But he is getting older and he really shouldn’t be doing a lot of the things he wants to keep doing by himself. 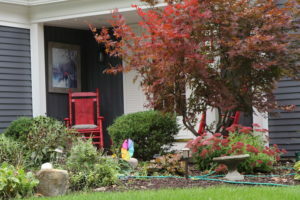 He owns two homes and maintains two properties, cutting the grass every week at his house and at the lake house, bagging leaves at two houses in the fall, and caring for all of the other little things that come up. His motto is don’t pay someone else to do something you can do yourself. The problem is, he thinks he can do everything. A few weeks ago we took the boat out of the water and his brother helped, which was great. The problem is when you get these two brothers together, somehow the process of everything we are doing becomes twice as long. It’s like the two of them together creates a space time contingency where everything slows down. We would normally have taken the dock apart and gotten the boat lift out of the water on the same day, but my mother-in-law was in town and we didn’t want to keep her waiting. Ironically, as soon as my husband and I walked into the house our daughter was mad that we returned so early because she wanted to play with Grandma alone. The weather was warm and it was a great day to be outside, so they spent the day playing in the yard. The following weekend was not so nice. It was cold and windy, so naturally that was the best time to get the dock out of the water. My dad has three sets of waders just for this job. Two pair are more rubber and less fitted and one is like a scuba suit. I immediately grabbed the scuba suit and headed for the water. I’m no fool. My husband and dad were left with the rubber pants. I had worn these same rubber pants in the spring when we put the dock in the water, so I knew they were great for keeping you dry, but not very good at keeping you warm. 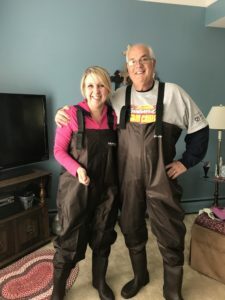 Since my husband had only ever worn the scuba suit, he walked out barefoot in his bathing suit only to find the rubber booted waders waiting for him. Instead of putting his jeans and shoes back on, he threw the waders on and headed for the water where my dad was already trying to dismantle the dock by himself since he’s clearly a young, strong man who needs no help. We spent the next three hours hauling the dock and boat lift out of the water, where anything that could have gone wrong did. 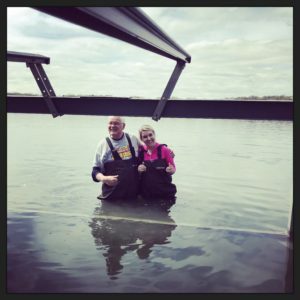 My husband was freezing and forming blisters on his feet, my scuba suit feet were flopping around in the water in front of me as I walked because the suit was made for someone at least a foot taller than me, and my dad was bleeding on his forearms after having the dock scrape him. At some point we also disrupted a bee hive between the rocks on the beach so we were being attacked by angry bees as we carried the dock out of the water. My mom was running around trying to bandage up my dad, kill the bees before we walked in with another piece of dock, and make sure that my dad was not over exerting himself. At one point she was even trying to help us pull the boat lift out of the water with the lawn mower, but she was nervous about giving it too much gas and knocking one of us down or pulling the lift into the wave runner lifts which were also lying on the beach. Putting a nervous older woman behind the wheel of anything is never a great idea. It’s an even worse idea when you have three idiots in rubber pants standing behind her yelling. By the end of the day both my mom and my husband were looking up companies who could come out to take care of all of this work next year. Between the two of them I’ll be surprised if my dad doesn’t wake up one morning in the spring to find his dock and the lifts in the water, having been put there by people who actually know how to do this stuff. It was a good thing that my mom was occupied on the third weekend we went out to finish up our lake winterization project. She probably would have had a heart attack watching my dad climb around on the boat lift like a monkey removing the canopy. 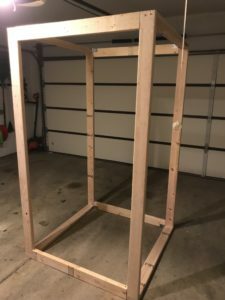 My husband did his best to stay ahead of the old man with the ladders and tools, but peter pan moves pretty quickly and was standing on top of a ladder pulling at bungy chords and pushing the canopy off the side of the frame in no time. I was beginning to see why my mom is on high blood pressure medicine after that day. My husband added up all the hours that we spent and decided that it was well worth the cost to pay someone else to do this next year. He told me all about it but I wasn’t really listening because I had been preoccupied for the last week and a half trying to get the videos on my phone onto my computer. I’m not great with technology, so things like this take me hours upon hours to resolve. When I was finally frustrated enough to throw my phone out the window, I asked my husband for help with tears in my eyes. He said “no problem Pat Jr. You realize I fix these types of problems at work for people all week right?” Oh crap. Just when I thought my biggest fear was turning into my mother, it’s not. It’s turning into my father and I already have.